Turkey's declining Christianity Jump to media player A century ago Christians made up 20% of Turkey's population, the figure is now just 0.2%. Sony hackers threaten cinema attack Jump to media player Hackers who targeted Sony Pictures are threatening to attack cinemas showing the studio's latest film. Miss World on her African heritage Jump to media player Rolene Strauss, Miss World 2014, tells Focus on Africa's Peter Okwoche how she feels her African heritage helped her clinch the crown. Millionaire sues ski slope chippy Jump to media player A former chief executive of one of the world's biggest cosmetics firms is suing a fast food stall near his holiday home in the French Alps. It is a year since a serious corruption scandal severely dented the image of the Turkish president, Recep Tayyip Erdogan. He has claimed since that the allegations were orchestrated by a political rival who now lives in the US. This week again, the government came in for sharp criticism from the EU, over a series of police raids on media organisations. 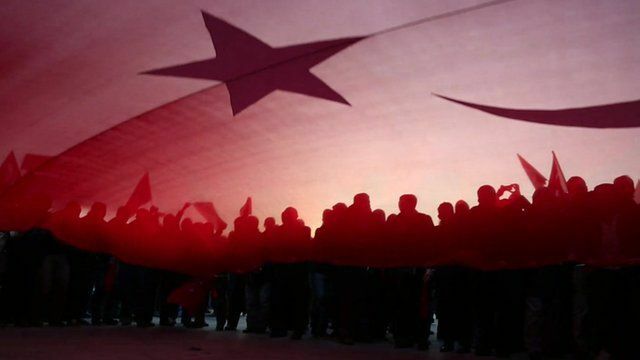 Mark Lowen looks back at a turbulent year in Turkish politics and what it means for democracy in the country.